This is a jellyfish sprite–so called because it resembles the eponymous sea creature. Jellyfish sprites are typically very large, stretching as much as 50 km between the tops of their heads to the tips of their tentacles below. 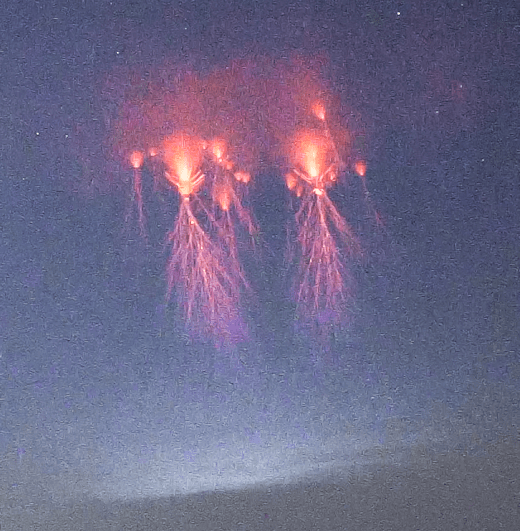 “Regular jellyfish sprites are associated with very strong positive cloud-to-ground lightning strokes in the underlying convective storms,” notes lightning scientist Oscar van der Velde of the Technical University of Catalonia, Spain. “In my experience, this is quite rare,” he adds. Another observer in the Czech Republic, Daniel Ščerba-Elza, also photographed the display. “It was extremely active,” says Ščerba-Elza. “I recorded about 69 sprites, much more than usual. The storms were about 250 – 300 km away in Austria and Hungary. This is a good distance because it allows you to see over the tops of the thunderheads.” He made a summary video of the outburst. Such an outburst before summer even begins may be a good omen for sprite photographers as thunderstorm season gains steam. Stay tuned for more sightings. “Venus is the bright ‘star’ just behind the windmill,” he adds. The blue pushpin in the satellite weather map, above, shows Smith’s location. The blue arrow points to the storm cell that produced the sprites. People have been seeing sprites since at least the 19th century, but those early reports were often met with skepticism. Sprites entered the mainstream in 1989 when researchers from the University of Minnesota finally captured them on film. Subsequent video footage from the space shuttle cemented their status as an authentic physical phenomenon. 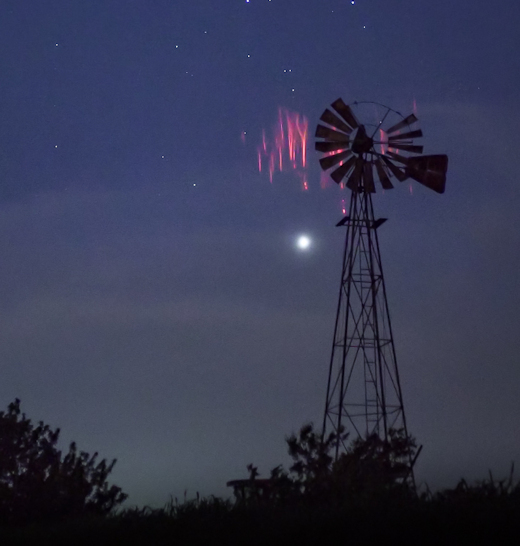 In recent years, citizen scientists have been photographing sprites in record numbers. But why? It could be a result of raised awareness. More photographers know about sprites, so naturally more sprite photos are taken. There might also be a real increase in sprite activity. Some researchers think that sprites are linked to cosmic rays: Subatomic particles from deep space strike the top of Earth’s atmosphere, producing secondary electrons that trigger the upward bolts. Indeed, cosmic rays are now intensifying due to the decline of the solar cycle. 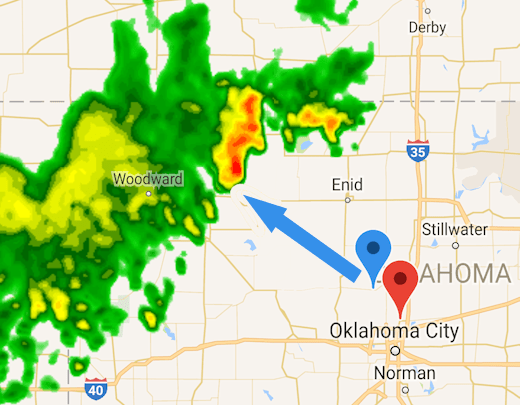 It all adds up to more sprites over Oklahoma. More examples may be found on Paul Smith’s Facebook page. Sprites are an exotic form of upward directed lightning. Although the forms have been seen for at least a century, many scientists did not believe they existed until after 1989 when sprites were photographed by cameras onboard the space shuttle. Now “sprite chasers” like Smith routinely photograph them from their own homes. The blue pushpin is Smith’s location; the arrow points to the sprites he saw on May 24, 2018. 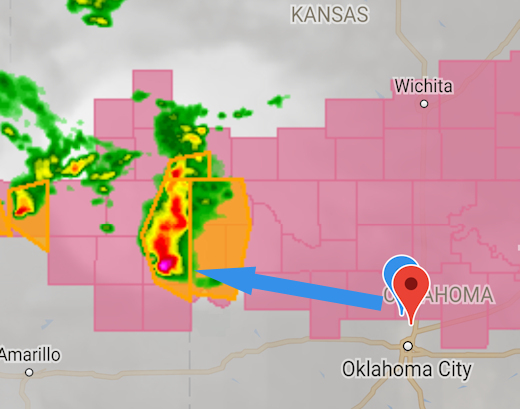 Oklahoma is the epicenter of a region that we call “Sprite Alley”–a corridor stretching across the US Great Plains where intense thunderstorms produce lots of upward directed lightning. Already this year we have received reports of sprites and their stronger cousins, Gigantic Jets, from Texas to Nebraska. And summer thunderstorm season isn’t even fully underway yet. Some researchers think that sprites may be linked to cosmic rays: Subatomic particles from deep space strike the top of Earth’s atmosphere, producing secondary electrons that trigger the upward bolts. If this is true, then sprites could multiply in the months and years ahead as cosmic rays intensify due to the decline of the solar cycle. More sprite images may be found on Paul Smith’s Facebook page. “It appeared for just a split second alongside the constellation Orion” says Popek. This is an example of an ELVE (Emissions of Light and Very Low Frequency Perturbations due to Electromagnetic Pulse Sources). First seen by cameras on the space shuttle in 1990, ELVEs appear when a pulse of electromagnetic radiation from cloud-to-ground lightning propagates up toward space and hits the base of Earth’s ionosphere. A faint ring of deep-red light marks the broad ‘spot’ where the EMP hits. ELVEs often appear alongside red sprites, which are also sparked by strong lightning. Indeed, Popek’s camera caught a cluster of sprites dancing nearby. ELVEs are elusive–and that’s an understatement. Blinking in and out of existence in only 1/1000th of a second, they are completely invisible to the human eye. 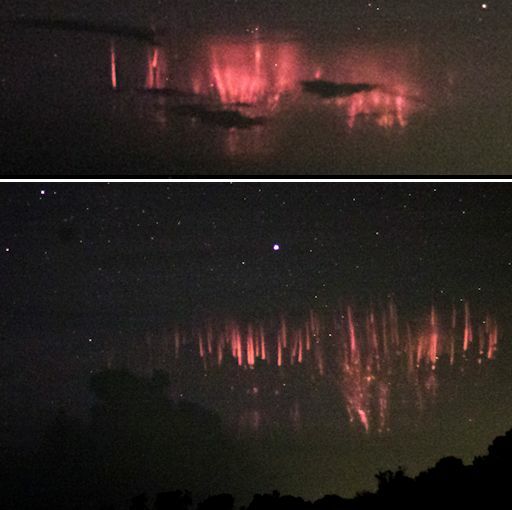 For comparison, red sprites tend to last for hundredths of a second and regular lightning can scintillate for a second or more. Their brevity explains why ELVEs are a more recent discovery than other lightning-related phenomenon. Learn more about the history and physics of ELVEs here and here. 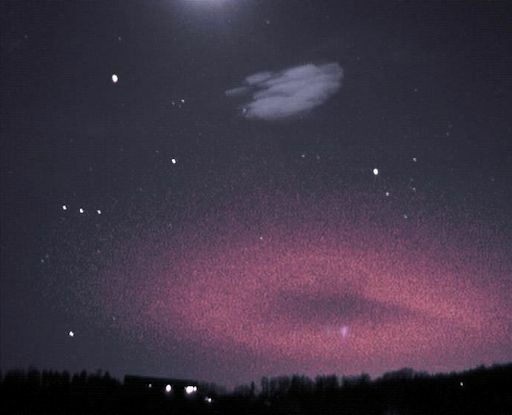 This is called a “mesospheric bore”–and not because it’s dull. A bore is a type of atmospheric wave with deep ripples at its leading edge. 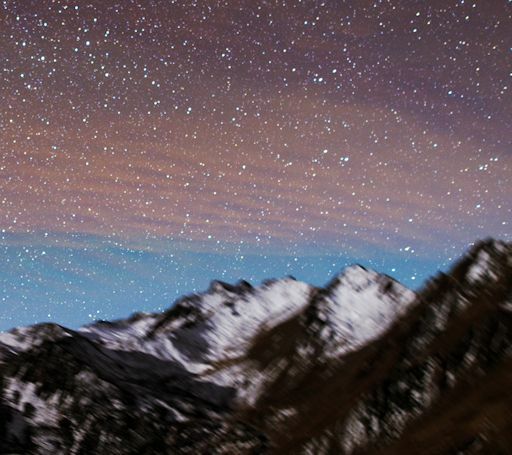 Indeed, you can see the ripples in Shuai’s photo separating the zone of airglow from clear sky. Bores fall into the category of “gravity waves”—so called because gravity acts as the restoring force essential to wave motion. Analogy: Boats in water. When a boat goes tearing across a lake, water in front of the boat is pushed upward. Gravity pulls the water back down again and this sets up a wave. In this case, instead of water, rarefied air is the medium through which the wave propagates. The sudden boundary in the airglow layer is probably akin to a hydraulic jump. But what created the disturbance in the first place? (What is the ‘boat’?) No one knows. Sprites are a strange and beautiful form of lightning that shoot up from the tops of electrical storms. They reach all the way up to the edge of space alongside meteors, auroras, and noctilucent clouds. Some researchers believe cosmic rays help trigger sprites, making them a true space weather phenomenon. Seeing sprites above a hurricane is rare. Many hurricanes don’t even have regular lightning because the storms lack a key ingredient for electrical activity: vertical winds. (For more information read the Science@NASA article “Electric Hurricanes.”) But Matthew is not a typical hurricane. 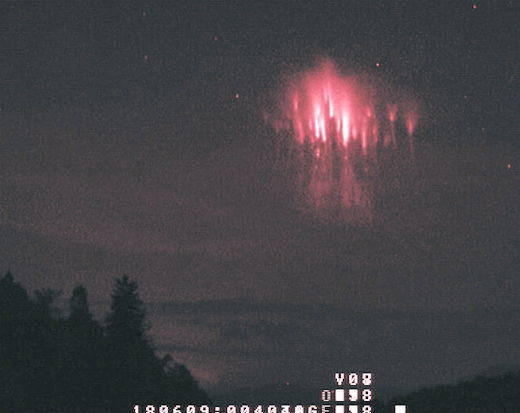 It’s one of the most powerful in recent years, briefly reaching Category 5 at about the time Lucena photographed the sprites. Perhaps extra-strong winds in the vicinity of the storm set the stage for upward-reaching bolts. Sprite photographers across the Caribbean and the southeastern USA should be alert for more as the storm system approaches the mainland: observing tips. 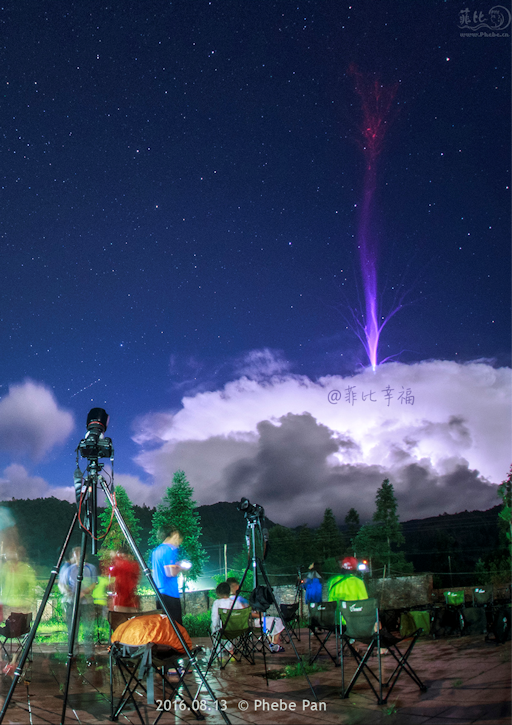 Think of them as sprites on steroids: Gigantic jets are lightning-like discharges that spring from the tops of thunderstorms, reaching all the way to the ionosphere more than 50 miles overhead. They’re enormous and powerful. “Gigantic jets are much more rare than sprites,” says van der Velde. 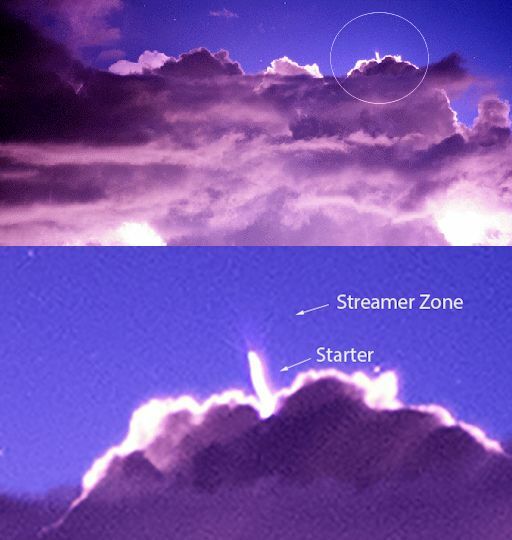 “While sprites were discovered in 1989 and have since been photographed by the thousands, it was not until 2001-2002 that gigantic jets were first recorded from Puerto Rico and Taiwan.” Only a few dozen gigantic jets have ever been seen. Like their cousins the sprites, gigantic jets reach all the way up to the edge of space alongside meteors, noctilucent clouds, and some auroras. This means they are a true space weather phenomenon. 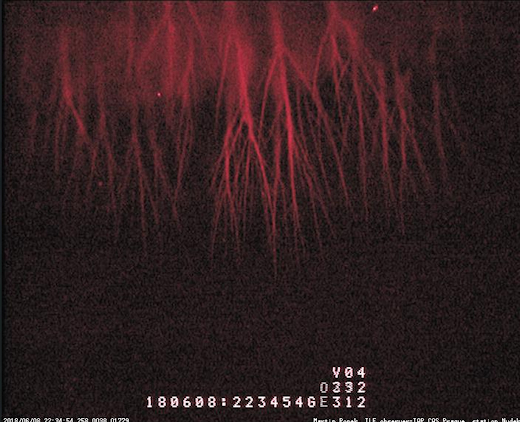 Indeed, some researchers believe cosmic rays help trigger these exotic forms of lightning, but the link is controversial.